Google search and display ads -- and Facebook ads -- may not be the best type of media to begin with to drive website traffic for direct-to-consumer retail brands, according to a report released Friday. The findings suggest that brands may want to begin with TV and radio -- including podcasts -- and then add search, display and video. The data suggests that combining radio and television advertisements delivers twice the site traffic compared with running Google and Facebook ads. The findings come from the audio network Westwood One, and the multi-touch attribution firm LeadsRx. The two companies analyzed the direct-to-consumer retail category using data commissioned from MARU/Matchbox. The findings reveal insights on the marketing effectiveness of DTC advertising campaigns, analyzing the type of media with the greatest impact, among other findings. The study reveals that a combination of AM and FM radio ads with television ads generates twice the website traffic lift of Google ads and Facebook ads. 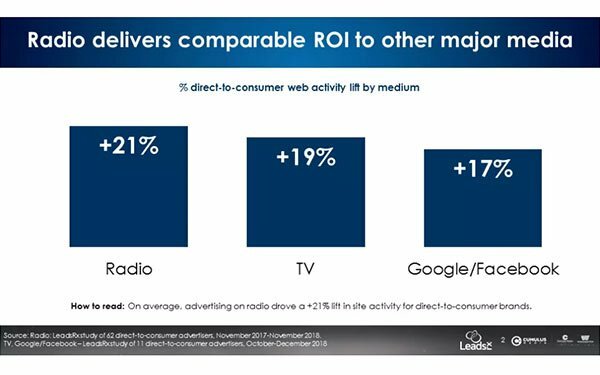 LeadsRx found that combining TV and radio drove a combined 40% site traffic lift, compared with 17% for Google and Facebook. For audio, podcasts and radio delivered the return on investment, according to the data. Ironically, DTC brands often initially launch search campaigns or other types of media on digital platforms using their own first-party data to drive performance, but the findings say they should do otherwise. The amount spent in TV and radio seems to generate a major impact when starting with audio and television. LeadsRx measured advertising campaigns of 62 DTC retailers in home, auto, events, entertainment, food, pet, apparel, and marketplace categories. It also measured the site traffic lift of these DTC brands generated by Google/Facebook, AM/FM radio, and television advertising. Separately, MARU/Matchbox fielded a national awareness study in January 2019 of 252 direct-to-consumer brands selected across a variety of categories. More than 1,300 consumers participated in the survey. During the study, television ads generated higher site traffic Saturday through Monday, while radio ads generated higher DTC site traffic Tuesday through Thursdays. DTC site traffic considered “prime time” is between the hours of 9 AM and 9 PM. The finding also suggest DTC categories experience different site traffic surges during each day. For example, home goods sites see the largest site activity 10AM to 7PM while entertainment sites have the greatest visitation 3 PM to midnight. The MARU/Matchbox awareness study found DTC brands have a long way to go in building mass consumer awareness. The top 20 DTC brands have an average awareness of 70%. The next 30 brands only average a 24% awareness. The remaining 200 brands have an average awareness of less than 10%. The awareness of DTC brands is highest among consumers between the ages of 18 and 34, and drops sharply in older demographics. Male awareness is higher than female awareness. Apparel and home products represent the most shopped DTC categories. Advertisers should view women between the ages of 35 and 64 as being the demographic with the greatest DTC revenue opportunity. Among those that say they are very likely to shop online retailers, 31% are women between the ages of 35 and 64, versus 24% of men between the ages of 35 and 64.